Real EMS - A Look Inside: Pet O2 Masks - SCFD has them, how about your department? Pet O2 Masks - SCFD has them, how about your department? *This has recently saved the lives of some local pets that were found in a house fire. 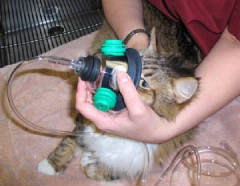 Veterinarians have used oxygen masks designed especially for animals for years. Now, Pets America is making this life-saving tool available for emergency responders.Nearly all fire fighters have seen people try to rush back into a burning building to save their pets, and most understand that pets are indeed beloved family members. With the right equipment, firefighters and EMS rescuers can often save a pet's life. We now carry these on the department I work for and I am so very happy about it, easy to use and all of our apparatus carries them. Here is what they look like and they come in a few different sizes. If you are the slight bit interested in how they work click on this link to view more.